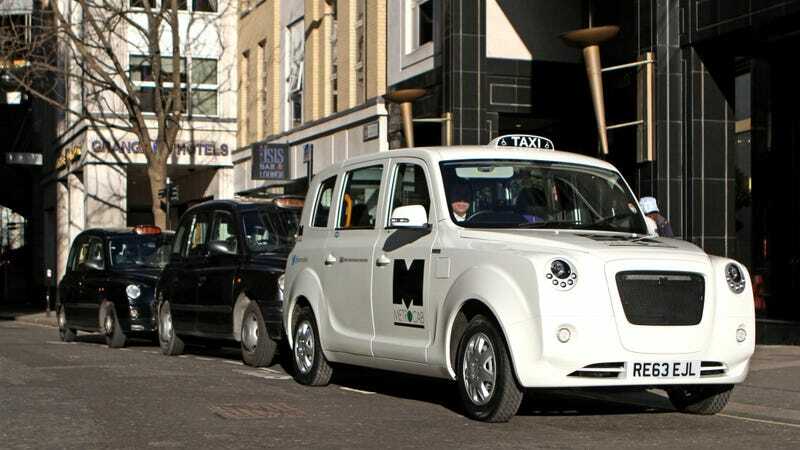 Ladies and gentlemen, I give you what's most likely to become London's next iconic vehicle: The new Metrocab! 75 MPG (imperial), a 347 mile range and a lower running cost that'll save the average cabby about 50 bucks a day. Nissan invaded New York with the NV200, aka the Taxi of Tomorrow. Since Crown Victoria stocks will only last for a few years thanks to a ton of them being destroyed by Superstorm Sandy, expect to see more and more of the little Nissans. Nissan also wants to become the number one taxi supplier for Tokyo and London. Back at home, Toyota is in the lead so far with this tasty concept, while in London, Nissan is ahead, enjoying a lot of support from the industry even if their product is a touch odd-looking. In the meantime, Chinese Geely was supposed to save the Hackney Carriage, but there's an awful lot of silence on that side, and with London spending a heap of cash on amazing custom made (and hardly viable) buses, local engineers decided to step into the picture with a new Metrocab. If the name sounds familiar, wonder no more. At this point, you might think "hang on, this white thing is ugly." Fair enough. It's is fatter than the original, yes, but keep going as this cab made by the occasionally genius Frazer-Nash and Ecotive is genuinely exciting no matter whether you like its headlamps or not. Not only does it come with a sport button, but this range-extended electric hybrid also claims to be three times more fuel efficient than the current black cabs, capable of 75 (imperial) mpg and 75% fewer CO2 emissions. Range is 348 miles combined. It's powered by a 12.2 kWh lithium-ion battery pack with an electric motor to each of the rear wheels together with a 1 liter petrol range-extender engine. 135 horsepower, 2,065 ft lb of peak torque, a curb weight of 3,858 pounds and a top speed limited to 80 mph. Its turning circle is 25 feet as the law requires. Inside, it's a proper six-seater with an optional seventh passenger in the front, a panoramic roof and a comfortable driver's seat for those long shifts with an air suspension to improve ride. There's also USB charging, full wheelchair access with an integrated wheelchair ramp, and a digital infotainment system with a color display and mood lighting. This completely British car has been in development since the mid-2000s with several prototypes built and over 600,000 miles of engineering tests completed. Ready to enter service this year, Fraser Nash says there will be no price premium to pay, while the Metrocab saves around 50 dollars a day for taxi drivers. Mayor Boris Johnson seems to like the idea, and with 8 out of the 11 F1 teams located in Britain, we know their engineers can do the job.